The Schwalbe Big Apple Plus 26" Tire provides comfortable cycling without using complicated technology. Bringing their Plus protection to this version, the tire adds 3 mm GreenGuard puncture protection for extra safety! Air cushion tires are used as natural suspension. Inflated to around 30 psi a Balloonbike rolls really easily and provides a comfort-enhancing suspension effect. A normal tire with a width of 37 mm must be inflated to a rock-hard 55 psi, in order to roll similarly well. Featuring a durable rubber compound, the Big Apple Plus is E-bike ready, capable of sustaining speeds of 25 km/h season after season in all conditions without breaking down or slowing you down. 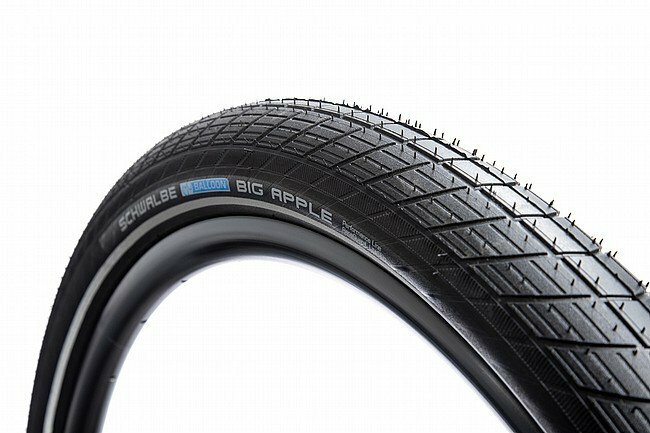 The Schwalbe Big Apple Plus (HS 430) 26" is available in one width: 2.15". I put these on a Gary Fisher Solstice comfort bike with a BBSHD mid drive motor. The brakes were already upgraded to Avid BB7 with 185mm rotors, and a heavy rider elastomer in the fork. I replaced the Hutchinson Acrobat 26x1.95 with these and dropped the pressure to 30 PSI. There is just so much vibration that doesn't even get into the bike now. Big hit capability is improved, and the slightly taller gearing is welcome also. The Acrobat was basically a full slick and it would move around sometimes on concrete surfaces. The BA is much better. The Acrobats were heavy due to flat protetcion belting also. In my case not much difference in weight to notice. I had to retune the fork a little get the handling right again. But the end result is much better. Even with a Cane Creek Thudbiuster LT seat post the ride of the hardtail frame is much improved especially above 25mph. I have a Bafang BBSHD mid drive conversion on a Gary Fisher Solstice comfort bike. I upgraded from the 26x1.95 Hutchinson Acrobats it came with. A very good tire in it's own right. The softer ride, better grip on dirty roads, reflective sidewalls, and slightly taller gearing were all a big plus. The Hutch's already had 1st rate flat protection so no change there.Due to the Ebikes range and ease of use I spend a lot more time riding and comfort is a bigger issue due to that. No down side to the bigger tire for my purpose. Going from 1.95 to 2.15 does make a big difference in ride quality. These measure 58mm wide mounted on the Sun Singletrack 31mm rims I'm using. So on some rims 2.3 is a more realistic figure.